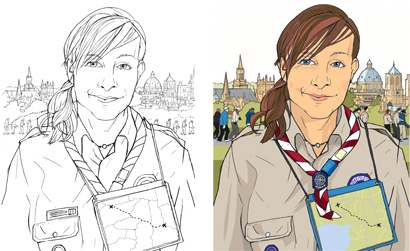 To celebrate the Scout Centenary in 2007, Royal Mail commissioned a series of stamps depicting 'life-changing' moments in the lives of young Scouts. In this design, an 18-year-old Explorer Scout walks 50km to raise money for Cancer Research, the greatest (and most meaningful) adventure in her life so far. Design and art direction by The Workroom.